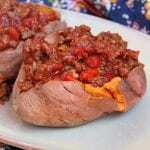 These Paleo/Whole30 Sloppy Joe Stuffed Sweet Potatoes are the perfect fast and easy week-night meal. Hearty, filling, and delicious, the entire family will love these! Scrub the sweet potatoes under warm water, removing any dirt. Pierce all over with a fork and place the sweet potatoes on a plate or in a bowl with 1/2 cup water. Microwave for 10-15 minutes on high (or 6 minutes for one potato at a time). Check the potatoes half-way through for tenderness and continue cooking if needed. Place the oil in a large skillet and heat on medium heat until hot but not smoking. Add the diced onion, celery, and bell pepper to the oil and cook until the onion is translucent and tender. Add the ground beef, garlic, chili powder, cumin, paprika, and salt. Stir to combine and use a meat masher or spatula to break the meat into small crumbles. Continue cooking until the meat is fully browned and cooked through. Add in the tomatoes with green chilies, tomato paste, and the agave. Stir well to combine. Simmer the sloppy joe mixture for 3-5 minutes, stirring to combine all ingredients. Serve hot over baked sweet potatoes or russet potatoes and enjoy! Calories and nutrition facts calculated to include one small sweet potato and 3-4 large tablespoons of the meat mixture per serving.